MicroTech’s Smart Prepayment Solution facilitates pay- as-you-go metering and billing system to the consumers allowing them to manage their payment for utility services in advance. Our prepayment solution is intelligently designed to attain the desired objectives of both utilities and end-consumer. It is a combination of server, software and prepayment meters, which complies with various local and international standards. In-built GPRS modem in the hardware enables a secure & reliable two-way communication between Smart Eye MDC (MicroTech’s Meter Data Collection Server) and Energy Meter deployed at the designated location allowing remote automatic readings. The meters follow international standard communication protocol DLMS/ COSEM that permits seamless integration with MDC. These meters are powered with software features which render prepayment functionalities reducing fixed cost of payment. MTI Smart Eye MDC located at the central database saves the metering data in the database which can be used for later retrieval and analysis using MTI Galaxy (MicroTech User Interface Application). The prepayment server, being essential component integrates with MDC and translates available pool of information into services as prepaid account maintenance of consumers; facilitating smooth functioning of recharging mechanism, and managing automatic load connection/ disconnection at consumer end, etc. 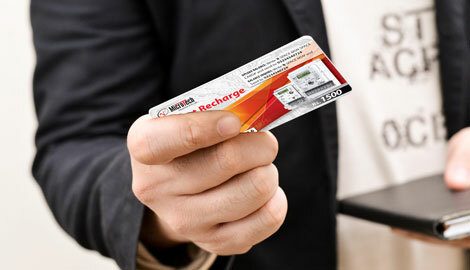 The end consumer are notified with all the relevant information regarding credit recharge, alarms and credit data on their mobile phone by the meter itself using the GSM/GPRS network. The prepaid credit voucher management system helps end consumer manage its utility consumption through a consumer portal which can be easily accessible on personal devices through an internet connection. Consumers choose the amount and frequency of payments while obtaining greater control over their consumption and expense. Similarly, solution offers consumers more flexible ways of recharging their balances through online consumer portal or smartphones using scratch cards. Also, solution allows seamless integration of franchise network with cash top-up option at traditional pay-points (e.g. shops and post offices). This wider range of options makes it less likely that consumer will find themselves unable to recharge their balance before their supply is cut off. On the other hand utilities can reduce their dependence on payment mechanisms that in the past have been open to tampering and fraud. Also, on the basis of number of units sold, the utilities can easily manage and plan the generation accordingly.